Joran van der Sloot told police in Chile that it was an unidentified robber who beat a young woman to death in his hotel room, a killing for which the Dutchman has been charged with murder in Peru. Peruvian police say Van der Sloot, long suspected in the 2005 disappearance of U.S. teen Natalee Holloway, has confessed to killing 21-year-old business student Stephany Flores on May 30 after they met playing poker. But according to a Chilean police report obtained by The Associated Press through Peruvian authorities late Saturday, Van der Sloot gave a different account of events while in custody in neighboring Chile, where he was captured after the killing and quickly extradited. In the version offered to Chilean investigators, Van der Sloot said he and Flores were surprised in the early morning by two robbers in an apparent assault. "A man came out of the bathroom blocking the access door with a knife in his hand. On the bed was another man with a gun," the Spanish-language report quotes him as saying. "The man with the knife said to be quiet, but Stephany began talking in a loud voice and he hit her in the face, making her nose bleed." Does Van der Sloot Know Where Natalee Is? It also says Van der Sloot told Chilean agents that the previous day, he and Flores had been extorted by apparent police officers who demanded $4,000 and a wristwatch he brought from Thailand. Chilean police told their Peruvian colleagues that the 22-year-old Dutchman responded in English to their questioning but refused to sign a declaration after learning he would be expelled to Peru. 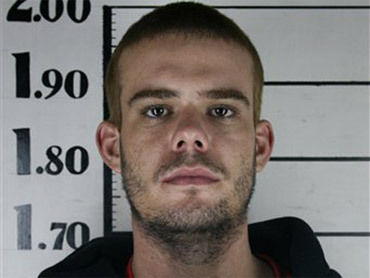 On Friday, a Peruvian judge ordered Van der Sloot jailed on first-degree murder and robbery charges. Police in Peru say he confessed to beating Flores to death after she learned details of the Holloway case from his laptop. He allegedly broke her nose, strangled her, threw her to the floor, then emptied her wallet and drove away in her SUV, said Gen. Cesar Guardia, chief of the criminal police. He then traveled south to Chile by bus. If convicted on the murder and robbery charges, Van der Sloot could get 15 to 35 years in prison. Van der Sloot's newly-hired Peruvian attorney, Maximo Altez, has asked the judge to declare his client's confession void on the grounds it was made in the presence of a defense lawyer appointed by police. Van der Sloot remains the lone suspect in the 2005 disappearance of Alabama teen Natalee Holloway on the Caribbean resort island of Aruba. Peru's criminal police chief said recently that Van der Sloot told interrogators he knows where Holloway's body is, but Aruba's attorney general said Friday he is skeptical Van der Sloot was telling the truth.